Based out of Punta Gorda, Capt. 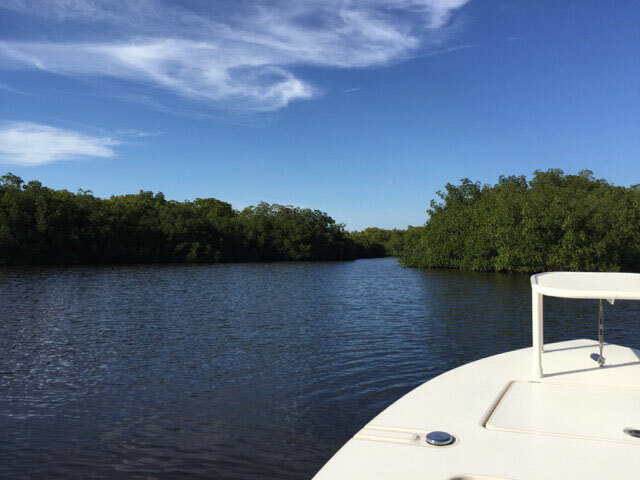 Mike has direct access to pristine Charlotte Harbor and all its adjacent bays and sounds. This estuarine system is the States second largest and is an estuary of national significance. In fact, 1/5 of peninsular Florida drains into Charlotte Harbor. An estuary is a partially enclosed body of water where fresh water from the land and rivers mixes with salt water. In southwest Florida, the Gulf of Mexico provides the salt water. Out of Punta Gorda, the Peace and Myakka Rivers provide the fresh water. A healthy estuary can be one of the most productive places on earth for marine wildlife. Typically, 80 to 90% of Florida’s commercially valuable fish and shellfish depend on estuaries. The vast amount of mangrove shorelines and sea grass beds are a vital component for fish nurseries and bird rookeries. Moreover, the vast majority of juvenile game fish species that use this estuary to mature and grow never leave. They become resident adults and are scattered throughout the bays and sounds that surround the harbor. 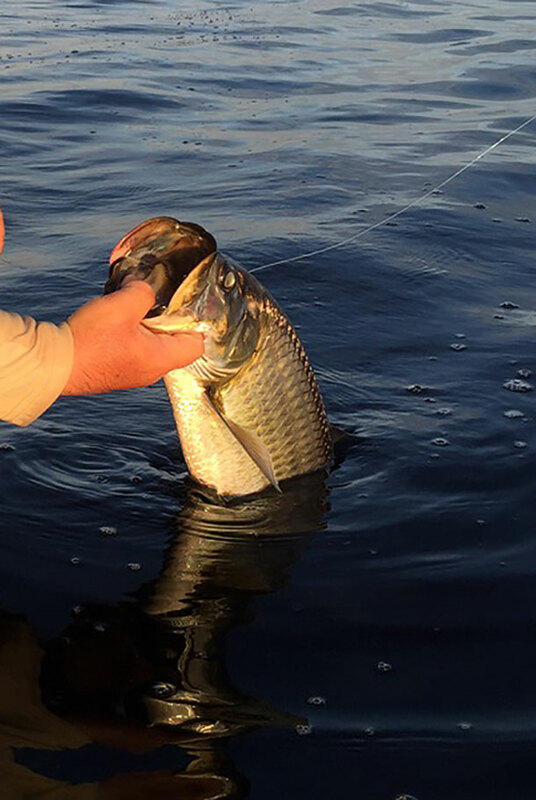 Learn more about fishing Southwest Florida and Charlotte Harbor here. Please call us at 941.628.7895 to arrange your trip. 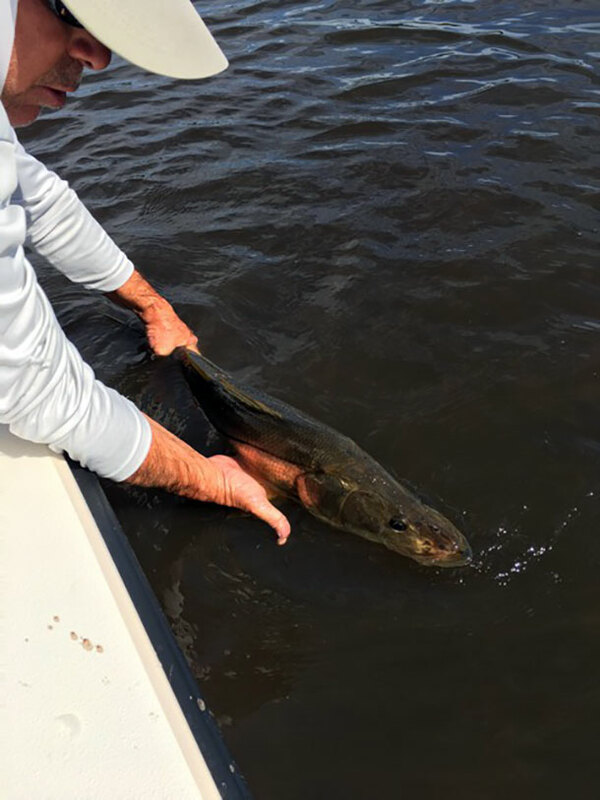 Throughout the year, various seasons provide opportunities for snook, redfish, tarpon, spotted sea trout, tripletail, black drum, and jack crevalle. In addition, the bow of a skiff is a great spot to work a line. With plenty of room for a back cast combined with the bow and casting platforms elevated positioning, the team work that can be established between the poling platform and the bow makes for an enjoyable experience. Moreover, all these game fish naturally eat small baits and there’s no better presentation than the soft landing that a small fly can make in a strike zone. Capt. Mike believes fishing should be fun. Teaching is his passion and beginning salt water fly fishers are always welcome. Learning to cast is very rewarding and he can help build your confidence.